BOSTON -- Moments before a judge sentenced him to death, Boston Marathon bomber Dzhokhar Tsarnaev rose to his feet Wednesday and apologized to the victims and their loved ones for the first time. "I pray for your relief, for your healing," he said. "I am sorry for the lives that I've taken, for the suffering that I've caused you, for the damage that I've done - irreparable damage," the 21-year-old former college student said haltingly in his Russian accent, breaking more than two years of silence. WBZ-TV's Jim Armstrong reports that Tsarnaev expressed "gratitude to Allah" and thanked his attorneys, before apologizing to the victims and to the survivors. #Tsarnaev: I am guilty of the bombing, let there be no lingering question about that. #Tsarnaev: After the bombing, i learned victims' names and saw their faces. After Tsarnaev said his piece, U.S. District Judge George O'Toole Jr. quoted Shakespeare's line: "The evil that men do lives after them. The good is often interred with their bones." "So it will be for Dzhokhar Tsarnaev," the judge said, telling Tsarnaev that no one will remember that his teachers were fond of him, that his friends found him fun to be with or that he showed compassion to disabled people. "What will be remembered is that you murdered and maimed innocent people and that you did it willfully and intentionally," O'Toole said. Tsarnaev looked down and rubbed his hands together as the judge pronounced his fate: execution. After the hearing, survivors voiced mixed reactions to Tsarnaev's apology. Lynn Julian and Scott Weisberg, who suffered PTSD and hearing loss in the attacks, said they thought Tsarnaev's statement in court was insincere. Julian said she was irked by his references to Allah and compared Tsarnaev's thanking his lawyers to an Oscar speech. "He threw in an apology to the survivors that seemed insincere and just thrown in because he was supposed to and he ended with Allah talking about leniency as if we should now be lenient to him," Julian said. However, Henry Borgard, who was a 21-year-old Suffolk University student walking to his dorm when he heard the explosions, said he was "really happy" to hear Tsarnaev apologize. Borgard, who has severe anxiety and nightmares and has been diagnosed with PTSD, said some of Tsarnaev's rhetoric was "hard to hear" but said the apology "is enough for me." The apology came after Tsarnaev listened impassively for about three hours as a procession of 24 victims and survivors lashed out at him for his "cowardly" and "disgusting" acts and urged him to show some remorse at long last. Tsarnaev assured the victims he was paying attention. "All those who got up on that witness stand and that podium relayed to us, to me - I was listening - the suffering that was and the hardship that still is, with strength, with patience, with dignity," he said. The outcome of the proceedings was never in doubt: The judge was required under law to impose the jury's death sentence for the April 15, 2013, attack that killed three people and wounded more than 260. A recent CBS News poll showed a majority of Bostonians are against Tsarnaev paying with his life. The only real suspense was whether Tsarnaev would say anything when offered the chance to speak. And if so, would he show remorse? Or would he make a political statement and seek to justify the attack? During his trial, he showed a trace of emotion only once, when he cried while his aunt was on the stand. And the only evidence of any remorse came from Sister Helen Prejean, the "Dead Man Walking" death penalty opponent, who quoted him as saying of the victims: "No one deserves to suffer like they did." In condemning him to death, the jury cited his lack of remorse as one of many factors. His apology was a five-minute address peppered with religious references and praise of Allah. He paused several times as if struggling to maintain his composure. He faced the judge while speaking, but addressed himself to the victims. Tsarnaev will probably be sent to the death row unit at the federal penitentiary in Terre Haute, Indiana, where Oklahoma City bomber Timothy McVeigh was executed. It could take years or even decades for his appeals to work their way through the courts. In May, the jury condemned the former college student to die for joining his older brother, Tamerlan, in setting off the two pressure-cooker bombs near the finish line to retaliate against the U.S. for its wars in Muslim lands. Tsarnaev was also found guilty in the shooting death of an MIT police officer as the brothers fled. Tamerlan, 26, was killed during the getaway. 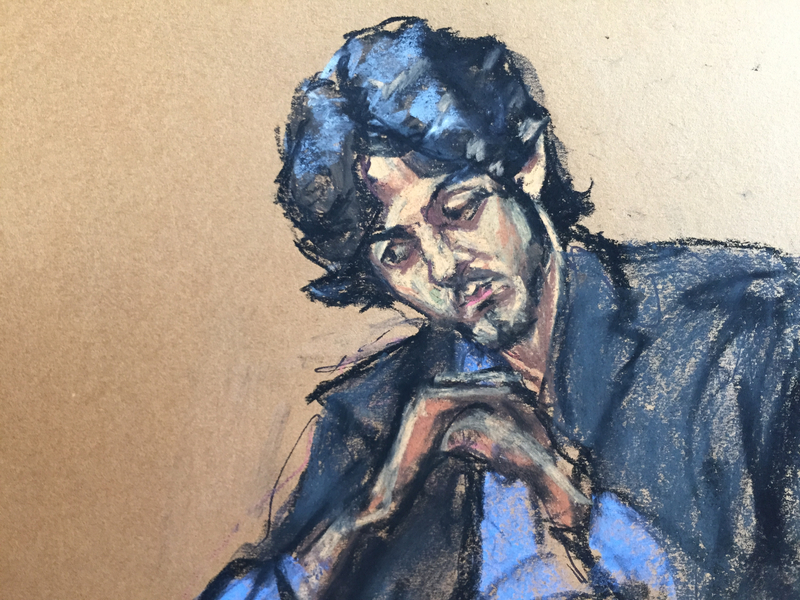 At his sentencing, a somber-looking Tsarnaev, wearing a dark sport jacket with a collared shirt and no tie, sat between his lawyers, his chair turned toward the lectern from which the victims spoke. He picked at his beard and gazed downward most of the time, only occasionally looking at the victims. "He can't possibly have had a soul to do such a horrible thing," said Karen Rand McWatters, who lost a leg in the attack and whose best friend, 29-year-old Krystle Campbell, was killed. Campbell's mother, Patricia Campbell, looked across the room at Tsarnaev, seated about 20 feet away, and spoke directly to him. "What you did to my daughter is disgusting," she said. "I don't know what to say to you. I think the jury did the right thing." Rebekah Gregory, a Texas woman who lost a leg in the bombing, defiantly told Tsarnaev she is not his victim. "While your intention was to destroy America, what you have really accomplished is actually quite the opposite - you've unified us," she said, staring directly at Tsarnaev as he looked down. "We are Boston strong, we are America strong, and choosing to mess with us was a terrible idea. So how's that for your VICTIM impact statement?" Bill Richard, whose 8-year-old son Martin was the youngest person killed in the bombing, noted that his family would have preferred that Tsarnaev receive a life sentence so that he could contemplate his crimes. Richard said his family has chosen love, kindness and peace, adding: "That is what makes us different than him."